Chelsea manager Maurizio Sarri is reportedly a leading candidate to be next Roma manager if he ends up being sacked from his position at Stamford Bridge. Roma recently hired Claudio Ranieri until the end of the season but could try to lure Sarri back to Italy if he becomes available soon, according to Goal. 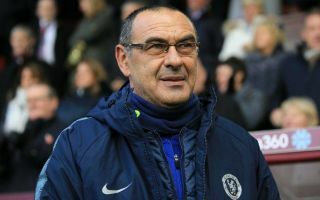 The Italian tactician was a big success at previous club Napoli, though he’s been unable to work his magic with Chelsea so far after a disappointing first season in charge. It now looks like the Blues will probably miss out on Champions League qualification after another disappointing 2-0 defeat to Everton in their last game. Still, Sarri’s reputation in Serie A may unsurprisingly still be strong as Roma could offer him a route back to a top job. Chelsea aren’t known for giving their managers too long if they struggle, and Sarri has overseen some truly shocking results, including recent thrashings away to Bournemouth and Manchester City by an aggregate score of 10-0.